Neymar in Dubai, but where next? There are growing rumors that Neymar, who has had four seasons of winning trophies and scoring spectacular goals at Barcelona, will bolt for Paris Saint-Germain. 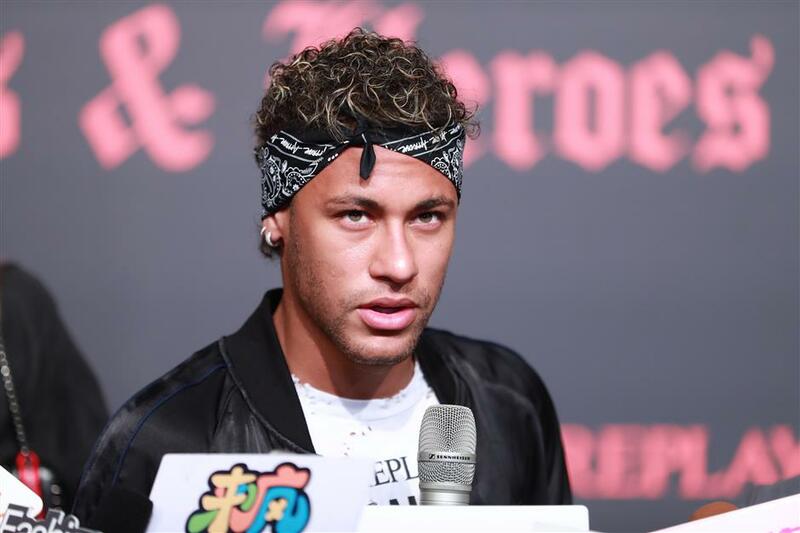 Brazil striker Neymar of Barcelona speaks to the media after attending a promotional even in Shanghai on July 31, 2017. Brazil's Neymar triggered a guessing game on his return from China on Tuesday, posting a video on social media apparently from Dubai but leaving his final destination — Paris or Barcelona — a mystery. As speculation mounts of an imminent record-busting transfer from Barcelona to Paris Saint-Germain, Neymar's video appeared to be from the first class lounge at Dubai airport. The 25-year-old forward, who was in Shanghai on Monday fulfilling a sponsor's engagement, also posted a photo with the caption in Portuguese: "Lunch at half-way". In another video posted from an aeroplane, Neymar jokes around with an image messaging app that superimposed a Spanish flag and a small plane on his tee-shirt — suggesting he is indeed headed home to Barcelona. The decor in that video was identifiable as from an Emirates aeroplane. Earlier reports claimed that he was headed from China to Doha, to meet PSG's Qatari owners and pass a medical before his reported 222-million euro (US$260 million) move from Barcelona. But his being on an Emirates plane rules out Doha as a possible destination given the diplomatic crisis between Qatar and its Gulf neighbors. Other reports had said the Barcelona forward could be headed directly to Paris after deciding to quit the Spanish club. BeIN Sport, like PSG backed by Qatar, said in a tweet in Arabic on Monday that Neymar had decided to leave the Catalan club, citing a club management source at Barcelona. However, following his latest social media postings, some Spanish media were reporting that Neymar is headed home to Barcelona and is expected to arrive on a flight from Dubai at 8.55pm. While Neymar has studiously remained silent about his future, Barcelona coach Ernesto Valverde is expecting him back at the club on Wednesday for the resumption of training, although Spanish sports media claim he won't turn up. Neymar, though, has a nasty surprise awaiting him upon his return as Barcelona has blocked payment of a 26-million euro bonus he is due, a source at the club said. "These 26 million euros have been placed with a notary pending to see if the player continues," the source, who refused to be named, said. The renewal bonus was agreed on a year ago when Neymar extended his contract with Barcelona until 2021, and was due to be paid to the player after he completed a year. But the club has decided to put it on hold while waiting to see how his transfer situation evolves. The contract Neymar signed also increased an early termination clause from 200 to 222 million euros, which PSG is reportedly willing to pay. Neymar's father, who acts as his agent and is also named Neymar, arrived in Barcelona on Monday. He was swarmed by journalists at the airport but revealed nothing about his son's intentions, The Associated Press reported. If PSG does sign Neymar, the cost of the transfer would more than double the 105 million euros that Manchester United paid a year ago for France midfielder Paul Pogba. PSG starts its season on Saturday, while Barcelona has until August 13. Two weeks ago, Barcelona president Josep Bartomeu told the AP that Neymar "is not on the market". He then told ESPN that if Neymar "wants to go, then they will have to pay the clause, right down to the last euro". Neymar first made his name at Santos, the former club of Brazil legend Pele, with whom he won the Copa Libertadores and Brazilian Cup. A big-money move to Barcelona followed in 2013 as 56,000 fans turned up for his official unveiling at the Nou Camp. In his four years with the Catalans he has won the UEFA Champions League in 2015, La Liga twice, the Spanish Cup three times and one FIFA Club World Cup. Last year he also helped host Brazil win the Olympic title for the first time.